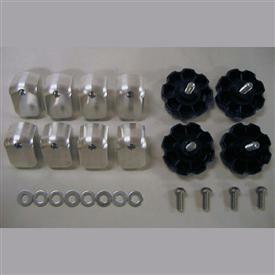 The kit consists of four CNC machined pucks for each pannier (total of 8). The bottom 2 pucks on each pannier hold the shear weight of the pannier and are permanently attached with button head bolts. The upper 2 pucks on each pannier are the clamping force that holds the pannier to the side rack. They are tightened with a knob ... a quick couple of turns and the puck is loose enough to rotate and turn down to remove the pannier... no tools needed. MK710A mounts cases to the BMW R1200GSA and KTM LC8 stock racks and other racks built with .710" tubing.